YOUR FEET NEED TO BE HEALTHY, STRONG AND HAPPY FEET! Remember the old adage, “If your feet hurt, you hurt all over.” It is true the comfort of your feet greatly influences the comfort of your whole body and your disposition. The foot is a delicately balanced mechanism far more complicated than the finest watch. Perfect balance is essential to retain foot comfort and the maintenance of this balance depends upon natural foot function. About 95 percent of the shoes made today disturb the delicate balance of the feet, to the extent they cannot withstand the jars and missteps incident to walking on the hard city streets of our modern civilization … thus the foot function is upset. This results in either tension or locking of the joints, strain in the muscles, limitation of foot motion, or a combination of all of those disturbances. The direct consequence is discomfort – aches and pains in the feet, legs, knees, thighs and back! BALANCED FUNCTION MEANS HEALTHY FEET. As long as this amazing balanced function is maintained, the feet will be comfortable.” And, so will YOU! Do the shoes that you’re wearing now hurt your feet, irritate your toes, causing you endless discomfort and fatigue? Do the shoes that you’re wearing now pinch and distort your feet? You should be wearing the world famous MURRAY SPACE SHOE! 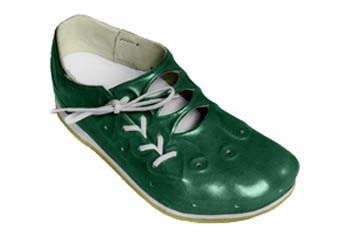 MURRAY SPACE SHOES are the worlds most comfortable shoes because they’re made not to fit the style. They are made to fit the shape of YOUR feet! At MURRAY SPACE SHOE the shoemaker will make a plaster reproduction of both of your feet. 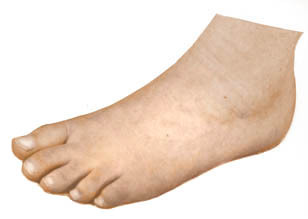 This process records all the contours of each foot. 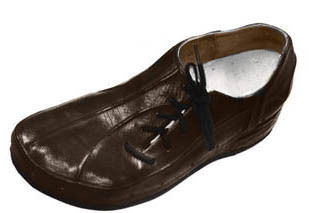 It is the first shoe in history molded to the exact contours of your feet. Made of the very finest materials to exacting specifications the MURRAY SPACE SHOE is unique and remarkable in fit, function, comfort, and craftsmanship. 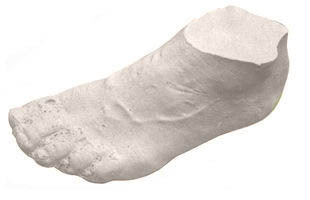 It celebrates the human foot for what it is, a marvelous, natural, functional mechanism. Moreover, a MURRAY SPACE SHOE looks like a foot. It acclaims the basic nature and beauty of the foot! If you want to experience the comfort of a MURRAY SPACE SHOE telephone. 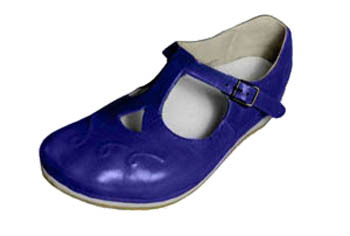 We make custom made shoes, custom made boots and custom made sandals by hand molding. Why are MURRAY SPACE SHOES the finest of footwear?